One of a number of monuments commemorating the World War II Battle of Bataan and the Bataan Death March, the Flaming Sword monument depicts a hand holding high a blazing sword. Simple and unsigned, it celebrates the bravery of the Filipino and American soldiers of the USAFFE whose death marches converged on this point in 1942. There is no charge to visit the Flaming Sword; this concrete monument is visible in its small park as you travel the highway. Most choose to visit it as a stop on a guided or self-guided tour of Battle of Bataan sites in Luzon. With no signage to explain its significance, it pays to have a guide. Given the traffic-clogged roads, it’s most convenient to book a Bataan history tour that includes transport from your hotel in Manila, or a private guide and driver. The Flaming Sword is worth a look for military history buffs and anyone whose family served at the Battle of Bataan. If traveling independently, it’s worth taking the time to read up on the Battle of Bataan and Bataan Death March before you go. The sword signifies the Philippines’ willingness to defend democracy. 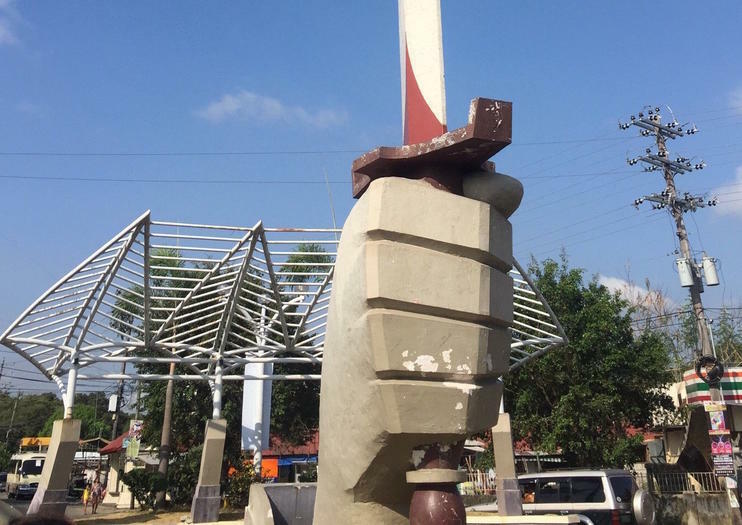 The Flaming Sword sits in Pilar, at the junction of the Governor Joaquin J. Linao Highway and the National Highway, a bit over a mile (1.9 kilometers) from the Surrender Site Marker. It’s about a 2.5-hour drive from Manila if you travel outside rush hour, or a 3.5-hour journey by bus: travel from Avenida to San Fernando City, then change for Pilar. Most who visit either drive or join a tour. The Flaming Sword is free to visit at any time of day or year, and with no walking involved the weather is unimportant. April 9, the Day of Valor (Araw ng Kagitingan), commemorates the fall of Bataan and is a holiday across the Philippines. Many Bataan war sites see commemoration rituals on this day. After the Battle of Bataan, around 75,000 Filipino and American soldiers, many already weak, sick, and malnourished, were forced to march some 66 miles (106 kilometers). Thousands died. The Philippines commemorates their memory with over 130 Bataan Death March markers, plus a range of war memorials, of which the Flaming Sword is one. The death march set out from two separate sites, Mariveles and Bagac, and the two columns converged at this point.